The Meaning of "Openness" for Professional Culture in the Digital Age; or, Why I Built WhatIsHistory.Net? In this post, I explain my reasons for building whatishistory.net, and, in doing so, I also present some ideas about the meaning of the notion of “openness” in the domain of culture as it is being pursued by so-called digital humanists. Whatisistory.net is a simple tool for collecting definitions of the field of history. It provides a form for entering a definition, which resides here. After a user has entered a definition, they are given the opportunity to answer a few questions that provide context for their definition – where are they located, what is their profession, etc. This information is also saved in the database and associated with the definition. Finally, all this information is and will forever remain in public domain. User contributions are licensed under a Creative Commons Attribution-NonCommercial-ShareAlike 3.0 Unported License. So, why did I build this site? The answer I’ll give is anecdotal, and I think helpful in understanding the ideas that lie behind the website. Indeed, one can see that many of those who operate in this field, and whose financial existence depends on its recognition within universities, are participating in a sociological process of establishing their legitimacy by establishing a domain of jurisdictional control that looks a lot like the one Andrew Abbott described in his classic book System of Professions: An Essay on the Division of Expert Labor. What Abbott describes is a process in which each profession seeks to carve out a space for itself within the professional and economic “ecosystem” of university, first, by defining a set of new problems that had been previously unknown or “unthought”; and second, by establishing a jurisdictional right to provide authoritative answers to these questions. A convenient example is the field of psychology, which established its authority in the early twentieth century by claiming to be able to explain the mechanisms governing the human “personality” – a concept that at that time was new and significantly different than the idea of human “character” that had been dominant in nineteenth century thought. What is interesting to me about digital humanities, however, is that for several reasons it may not quite fit into Abbott’s conception. For, if it is to be a self-contained profession, it is still unclear exactly in relation to what kind of practical problems it will establish its domain and authority. Presumably, digital humanists will be able to authoritatively answer practical questions regarding how a range of workers in the humanities, from historians to literary critics to philosophers, can use computational tools to carry on and extend their existing practices. But, if that’s the case, why can’t the insights of digital humanists, as they’re often called, simply be absorbed into the already-existing disciplines? Indeed, a great deal of work in the digital humanities is already done by young computer-literate historians and, in particular, literary scholars. So why does digital humanities even need to to maintain its own domain at all, let alone occupy its own department within the university? Then, also, there’s a bigger question relating to the socio-historical meaning of digital humanities – and this is what I was getting at in my original post. For it may be the case that what we call digital humanities is in fact part of a much broader socio-cultural transformation – one in which the practice and meaning of (big C) Culture, as it has been maintained and defined in the twentieth-century university as “professional expertise,” is now undergoing a change. This change may have been provoked by the conjuncture of the 1960s-era anti-hierarchical “disruptive” ethos with tech-fueled labor and market culture of Silicon Valley. Put another way, there may be a deeper historical relationship between the migration of the center of capitalism from Detroit’s auto factories to Silicon Valley’s tech campuses, on the one hand, and the emergence of “digital humanists” within the academic fold. If so, those who would seek to establish digital humanities as a well-defined and hermetically sealed domain of expertise and authority may be pursuing a conception of cultural expertise that belongs to the “old” model of industrial-era hierarchical control and management rather than Silicon Valley’s desperate clamor for cultural disruption and tech-flattened hierarchies. In saying this, I want to be crystal clear that I am unsure of whether this is a good or a bad thing; I am simply seeking to understand and describe its sources and consequences. I do not, however, believe that the that technological change is simply “opening” the university in the sense of making it more accessible and egalitarian. Rather, it is precisely this kind of sentiment, which some call the “California Ideology,”2 that has acquired a potency to which the university must now respond, and I believe that digital humanities is at the center of this cultural process. To return to the issue at hand – why I created whatishistory.net – as these questions ran through my mind after sitting down to revise my original post, I quickly felt unsure of how to answer them. I realized that I couldn’t see what the digital humanists of the world were up to. Then, as I looked over the numerous attempts at definitions online, I discovered a website called What is Digital Humanities?, created by Jason Heppler, which selected randomly from a set of some eight hundred definitions of digital humanities collected by a project called Day of Digital Humanities. Having discovered this corpus of definitions I decided to run some very simple computational analyses across the set of definitions using the python Natural Language Toolkit. Given that my questions related to the degree to which digital humanists thought of their work as contributing to a well-defined profession, I decided to inspect the use of the word “open” – certainly a byword of Silicon Valley if there ever was one – and I discovered that indeed it was used with some regularity. 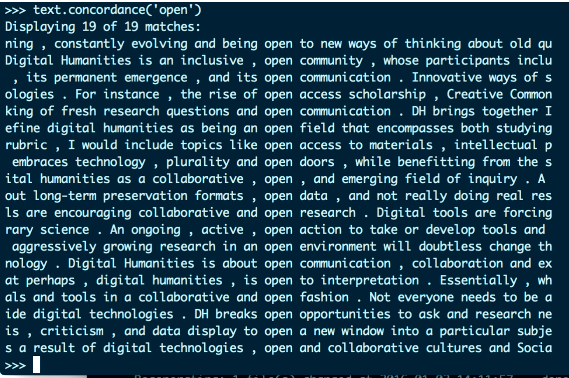 In almost every instance of the word’s usage a very clear set of ideas expressing a clear relationship between digital humanities and an “open” approach is evident: “open community,” “open communication”, “open doors”, “open research”, “open environment”, “open data”, and so on. Even the field itself is an “open field” and “open to interpretation”. So although what this concordance algorithm provided is not yet a complex statistical model of the text, it rather quickly revealed a word, which was used nineteen times to communicate a very clear, and rather radical idea that is also central to Silicon Valley – “openness” – and this seems significant to me. Now, I want to stop this analysis here. Because although many other questions come up here about the meaning and value of this kind of analysis – all of which I hope to explore more fully in the future – it is at this point that I realized the need for a website called whatishistory.net. Since I was now considering the possibility that digital humanities is about “openness” in some significant way, I wondered what patterns would a large a corpus of definitions about, say, the field of history reveal? It seemed very unlikely that the word “open” would take on such a definite significance in such definitions, but if not the word “open,” then what? If I was to generate computational models aimed at understanding the meaning of definitions of digital humanities, I/we all need to have something to compare against. Traditionally, our definitions of history have been more or less deeply held personal convictions, kept close by the individual practitioner. Every historian has one in the form of ways in which they approach their projects, and yet they are expressed tangentially to descriptive content, usually laid out in introductions that serve as a key-code for other historians to access the assumptions underlying the story being told. Of course, it matters a great deal if one is a social historian or a cultural historian, but nonetheless these definitions are usually deeply embedded in one’s practice. The relatively few comprehensive definitions that exist take the form of long essays by confident souls that venture overarching definitions of various kinds. Some target the whole field, a prime and well-known example being E.H. Carr’s What is History? Others examine broad trends targeting “generations” of historians or a “subfields”, such as John Toews “Intellectual History After the Linguisitic Turn” or Gabrielle Spiegel’s “The Task of the Historian.” And then there are sophisticated analyses, more typical of contemporary culture’s postmodern ironic self-reflexivity, that treat the question of what history has been as a historical question, for example Hayden White’s magnificent Metahistory: The Historical Imagination in Nineteenth Century Europe. And the list goes on. In each of these cases, however, the definition of the field arises from a well-trained and erudite voice, seeking to provide some broader perspective on what a large number of people are trying to do. They are, in other words, powerful syntheses by extremely smart hard-working people – and that is very valuable indeed. But one of the things that the digital humanities offers – for better or for worse – is the capacity to analyze, computationally, the voices of a great many, presuming those voices are available in a form that can be parsed by an algorithm. This, then, is the goal of the whatishistory.net site: to create a very large corpus of definitions of history that are accessible to algorithmic manipulation; that is, that are plastic to the algorithm’s interpretive logic, and can be represented and re-represented hopefully to provide different kinds of insight over time. Significantly – and again for better or worse – one of the characteristics of this kind of resource is that “authority” will emanate from it in a very different way than the remarkable texts mentioned above. Because in this corpus, and in many of the computational models that one might build from it, the voices of the erudite will have become just one node in a very large network of meaning and representation. This may yield a different kind of knowledge about what scholars are doing, and as I’ll explain next it may even be a kind of knowledge that contradicts or challenges the kinds of insight that erudite experts are capable of providing. Because the corpus that I’m proposing would include shorter definitions produced over time by larger numbers of people, the insight that these definitions provide may reveal alternative characteristics of the professions. In addition to revealing certain trends in the methodological self-conception of historians in a more “real-time” manner, it’s also possible that a significantly large corpus could reveal the coexistence of multiple, layered “shadow” domains across the scholarly ecosystem, both within and without the university, that coexist and overlap. I suspect that individual historians already mind these alternate networks of disciplinary practice and identification, usually talking about them as “sub-disciplines” or in terms of “interdisciplinary” activities. But perhaps what is really happening is different. Perhaps it’s not so much a question of being “sub” or “inter” (i.e. inside or outside/between). Perhaps instead those who identify as being part of a “sub-discipline” or an “interdisciplinary perspective” – or, for that matter, those who practice scholarship along various forms of political activism – are actually taking part in multiple collectively practiced alternate ecosystems of scholarship that exist apart from the sanctioned managerial structure of the universities; that is, whose jurisdictional lines shadow the “primary disciplines” but occupy an alternate, though no less real or active, dimension. If so, with a sufficiently large corpus of definitions, we might eventually be able to make these co-existing practices visible and knowable. Put in another way, maybe there are forms of scholarly practice in the university that are already more “open”, and more shifting and dynamic, than we have up until now been able to be aware. Maybe this is something that computer algorithms could help us mind more concretely. This, then, is the set of ideas that underlie the whatishistory.net website. The success of any of the goals just described depends entirely on people’s participation in the project. So please contribute a definition, or many, to the website; and if you would like to discuss this project with me, get in touch! I welcome feedback, so please write to me via email or twitter with any comments and/or questions. Copyright © 2018. All information placed here is in public domain.